We watched both episodes of Clean With Passion for Now and will be posting them both today. 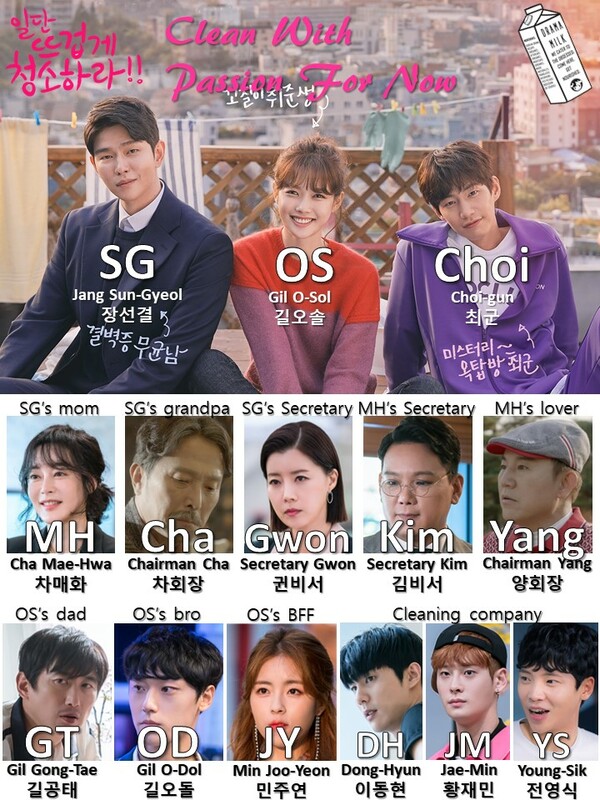 I loved both episodes, they were fun and light while also showing the reason why they are the way they are and pretty much why/how they are in the situations they are in. We will start recapping this live-ish (starting at 9am CST) next week. See you then! Caution: Be wary of typos. We open with an adorable looking private rich kid looking at something. We hear kids in the background, but we don’t see what he is looking at. he turns to walk away, but then he turns back and walks up to a kid. He asks her if he can play with her. But when she turns around she looks amazingly dirty and is picking her nose. She rolls the bugger and flicks it at him. But it was all a dream! Thank the Lord. He wakes up and shakes off that hideous gross nightmare and starts to get ready. But he isn’t that kid anymore, he is a grown A** man living in a spotless home with sharp clean modern objects all around him. We follow him as he gets ready in the morning, everything is clean but he does notice a few tiny unclean things (by his standards). he finishes dressing and talks to his little robot happily as he asks the vacuum robot how he looks and smiles as the robot does a little twirl for him. But he sees a little spec on the glass. He writes a note for someone to do some cleaning. Then he leaves to get in his car, but he opens the door with his handkerchief and cleans the steering wheel and everything with his handkerchief. He speeds off in his cadilac on his way to work. Cut to our heroine, Gil Osol yawning and meandering at a bus stop. She is still unkempt and almost misses her bus. But she manages to just squeeze in and goes about trying to find a seat in the very packed bus. A voice over starts to talk about our dirty life we live now as the camera shows all the people coughing and touching things on the bus. VO – A lot of people live together, you never know what kind of people are holding the bar or inhaling germs from someone. It is so normal for people living in current times. But do you really think it is no problem? News: a lot of people are infected with Mirth. We are looking for where it started, please where your mask. The Hero, Sun-gyeol thinks that the country needs to do a better job. he can’t live seeing all these people without masks on. They should wear there masks, how can’t they care about safety! Osol finds a seat and promptly falls asleep against he window. Sun-gyeol pulls up right next to the bus and is startled to see Osol sleeping so grossly against the window. He locks his door and puts his car in gear to leave mumbling about how dirty it is this early in the morning. So unsanitary! We pass through the traffic lights (that change to hearts) and see the title. SG goes to work and gives a presentation about how they need to protect themselves against all these dirty viruses in the world. Everyone claps. OS is at work and has post its everywhere. Her desk is very messy with paperwork, post-it notes, stacked books, and crinkled up trash everywhere. It looks like she is the manager of the study room. Cut back to SG’s presentation. he is giving a Ted talk like speech about being dirty and getting a hob and being happy. Back to OS, she is preparing her meal in the study room and overhears a girl talk about Sun-gyeol who is watching his presentation over the screen. She thinks he is the best most handsome man. OS starts to pay attention to his speech. He talks about how young people ry to crack into the job search and be a gongwon. OS looks at her book, it is the exact book that OS is talking about. But SG thinks they are doing it all wrong, they need to do what they can do the best, not what other people want them to do. he became a cleaner because he can do that the best. Cut to THE BTS OF cleaning boys walking through the street with all their cleaning instruments. The girls go wild as they look at these guys walk through the street with their pinkish-fuchsia cleaning outfits. Joo-yeon looks at them with interest like a fan girl. OS comes up to her and asks her what she is doing. JY explains all about the BTS like cleaning guys and how they are all over social media. OS does not care about them, she has a crush on someone else and is looking at him right now. Joo-yeon asks if she really likes him? OS says yes and she will confess when she gets a job! but JY just tells her friend that she needs to clean herself up first. When was the last time you cleaned your clothes? If you take them off then they will stand up by themselves. She also says that Do0jin got a job. Scene change to Sun-gyeol walking out of his presentation to standing applause. he walks down the stairs with his secretary, Gwon who speaks in a matter of fact way and tells him that she sanitized the table in the waiting room and his change of clothing is there. he has no more interviews today. Sun-gyeol tells her that she is going back to the company right? She says yes, she has something to take care of. But she also asks how his new maid is. SG says that it is okay, not 100%, but one post-it is not bad. Gwon tells him that it was hard to find the right person, so please stick with them for a long time. Also, good luck with your meeting (maybe a blind date?). He smiles and goes into the restaurant (holding his handkerchief to the door handle) and then cleans his chair and puts his handkerchief on the couch to sit on. He finishes it off by spritzing his face. All the employees and customers look gawk. The woman shows up to meet with him. She makes small walk about his live speech he just gave and how he did a great job. He tells her it was because of her good lead, that is why people call her a veteran. He starts to drink his cup and looks at her on the sly. VO – It seems like she takes care of herself well. But then she puts her hair behind her ear which shows here ear. It is filled with earwax. he loses his s***t, coughs up his water and makes an excuse about how he has to run off. The woman is all like, what just happened? He just left? With out me? She laughs hysterically. Sungyeol gets home still muttering about how that woman needs to clean her ears. he thinks his cleaning robot would have tried to do it even. But then his mother and her secretary come in and complains about his meeting with that woman. What was wrong with her! You said she took care of herself well! But he just starts to complain about her ear wax! Her ear wax! Big yellow ear wax! The robot leaves so SG follows. He sits on the couch where his mother catches up and tells him that humans have ear wax, just apologize to her. This is so embarrassing. Her secretary tells umma that he made 10million dollars so…~. But umma said that the company is a small corner store. The secretary is all like, well, compared to your company it is a tiny corner store. The robot starts to leave again, SG follows him once again. But loses him, the robot is actually stuck in the door. he asks his mother if he saw Goomja? Umma is all like, Goomja? Are you hiding a woman? Scene change to Osol, she walks on the street and thinks about sending her crush a text. Should she write congratulations for getting a job? Sunbae, I will miss you? But she does not send any of it because she thinks it is too cliche. But as she is walking, she stumbles upon the robot vacuum, Goomja. She wonders who would throw this away? Do people know how precious things are nowadays? She puts Goomja in her bag and then wonders what she should text. SG is running around the street now and sees OS, he runs up to her to ask her if she saw his robot. But one sight of her up close makes his gag reflex activate, he has to run away. OS keeps walking until she gets to her brother, Odol, about to kiss a girl in the alley. She walks right up on them and asks what he is doing. then hits him on the head as she mutters that he tries so hard (too hard?). She goes inside and stretches a great big stretch then turns around when she hears her appa. But it isn’t her appa, it is a strange half naked man who just got out of the shower. This half naked guy is Choi-gun. OS runs around screaming, what are you doing in someone else’s house! She grabs a broom to hit him so he runs outside trying to explain things. Her father hears all this and tries to explain as well, but he throws his back out in the process. Everything stops. Cut to Appa getting icy hot patches put on his back as this mess up is being explained. Choi is taking a shower because he moved to the octapang. OS tells him that he should have told her that. She mutters about taking a shower naked but he is all like, of course you are supposed to take a shower naked. Appa starts muttering about his back. But then appa sees the robot vacuum in OS’s bag. OS thinks they should fix it and try to sell it. Cut to the vacuums perspective as the three of them try to fix it. But it turns on and they all flip out, it works! Appa wants to know where she got it? She says she picked it up at the trash location. Back at SG’s place, he is looking at all the CCTV to try and find his vacuum and ends up having his cleaning crew put up signs the next day. Dong-hyun complains about doing it, but Jae-min thinks image is important and smiles at a few girls walking by. A student walks by the sign and gulps when he reads it. REWARD: $1000 to find the vacuum. Elsewhere, Osol complains at her coffee shop to her friend Joo-yeon about not getting a job. She at least wants to get past the resume step. Her friend tries to give her advice but says that her resume and description is too cliche, she will not get anything. Osol is annoyed and tells her that she is supposed to be her friend then complains about having to pay for a hogwon. But she remembers the vacuum and asks her friend if she would like to by it? $100 but discount for $90? Her friend tells her it is a deal. But then she gets a call that her father is at the hospital. She goes to the hospital and eats lunch with her dad. It does not look like a big issue, it looks more like he is in the sprained something or other part of the hospital. Maybe this is for his back? Appa tells her that he called someone, so just go there and do what they tell you to do. Are you ashamed of my appa? OS says that it is not like that, she is looking for a job right now. They bicker back and forth about how this is all OS’s fault because she threw out his back last night. She tells him it is because of that octapang guy. You need money but you should screen people better, you have a daughter after all. Cue imaginary evil laughing from Choi. OS gets home and sees a woman leaving Choi’s octapang. It looks like they are dating. But then he sees Osol and asks her how her father is doing? I told him to go to work later, he did have back pain after all. The girl walks past Osol with a head flip which makes Osol tell Choi not to be a jigalo and don’t cause a lot of issues. Choi looks confused. Night falls and Osol happily holds on to the back of the dump truck or some type of huge cleaning truck as she fills in for her father. Back with Sun-gyeol, Odol sees the flyer and calls Sun-gyeol about the vacuum. But it is more like he is holding the vacuum for ransom. At work, Osol cleans in the alley but is being picked on by some fellas. They are drunk and throw a can at Osol. She loses her mind and yells at them to have better manner! But then she sees her crush and immediately turns away. The three drunk guys apologize as the crush walks up and asks Osol if she is okay but then see that it is Osol. Osol is so embarrassed and takes off wearing a horse mask on accident instead of her helmet. Her crush chases after her so it becomes a scene of Odol running with trash and a horse mask as a man runs behind her and a lot of other people chase after them while taking photos and video for social media. It is an event, y’all. She runs by her brother and his friends as well who see all the commotion of everyone following this horse woman around. Odol keeps running and passes by an outside concert with a person singing who is also wearing the horse mask. Everyone on stage has it on actually in some kind of weird Twilight Zone moment. Finally Odol is able to escape all the people running after her and manages to take off with only a few little kids yelling at the horse. But she accidentally runs right into Sun-gyeol’s car! Her trash flips all over it making it very dirty. To his credit, he runs out to see if she is okay first. She says she is fine so he looks around and then sees all the trash on his car. It is a disgusting sight. But all the people have caught up to her at this point, including her crush so Odol wants to leave right away. She cleans up as much of the trash as she can and gives Sun-gyeol a note with her name & number on it. But she is still wearing her mask and the situation is strange so Sun-gyeol tells her to take off her mask. He thinks she is a man though. He pulls of her mask to the unending embarrassment to Osol. Sun-gyeol apologizes and says he did not know she was a woman. But Osol is so embarrassed in front of her crush and everyone else (including the singers). The singers start to sing a song as she walks away. Song: Don’t give up your dream…you are the main actor in your life….be brave and be truth full…. It is the walk of shame to a soundtrack as Osol hangs her head and walks away still lugging all the trash behind here. She gets home and curls up in bed immediately. her brother gets home looking concerned for her, but leaves her alone. Secretary Gwon tells Sungyeol that it will take a week to clean the car. he asks her for a new car, sanitation might not remove all of those germs. She tells him that she will look into it and can get him a new vacuum, she can find him a better on. But he is adamant about this vacuum. She reveals that she has always wondered why he is so obsessed with this particular vacuum. He tells her it is because it is a limited addition from Italy, but it looks like the secretary knows that is not the case. But she doesn’t press it and just smiles knowingly. Flashback to Sun-gyeol visiting a halmoni. She got a vacuum and tells her young master that it is for him (perhaps she was his old maid?). She tell him that this vacuum is very good and will be useful when she is not there. He pushes her around and tells her that he wants her to get better and come home. The house will not be clean anymore without Goomja. She smiles and holds his hand as he pushes her around the hospital. At home, Sun-gyeol texts someone to tell them that he is sorry he did not pick up their call, he will call them later. He sighs, and settles into the evening. But then he sees a picture of the CCTV woman and remembers her as the horse head woman! Osol goes to eat out with her friend as her friend gets a good chuckle at the horse head woman that has gone viral on the internet. She thinks she can get a job as a comedian now because that video has so many clicks. Osol doesn’t want to hear it and really isn’t upset about anything but her crush seeing her last night. Her friend asks why she likes him so much, he isn’t all that great. Osol says that is why she likes him, he is just a regular normal Korean guy. VO – He is kind and cares about others but does not show off. He does not ignore anyone. That is why I like him. that kind of person looks at me. Joo-yeon snaps her out of it with a: Forget that (or F-you). Why are you talking about that? You are in his trap as one of his wannabe girlfriends for the last three years. Why hasn’t he dated you for 3 years. OS tries to say it is all timing. But Joo-yeon basically says she will die waiting for good timing. then she changes the subject to the accident and if she is meeting that guy. Cut to OS meeting SG. We are privy to his thoughts that are all about how dirty and messy Osol is. He immediately sprays sanitizer all around on her and himself. He tells her not to worry, it has all natural ingredients so it is good for humans. Osol apologizes about yesterday and tries to say that she is not like that. Sun-gyeol shows her the damage she did, $3,500, but it does not include his hospital bill. She is floored at the price and asks if there is a discount or something like that? I am looking for a job – no, I am a student. He says that he thought she was a student? She says that she is looking for a job – (you said you are student?) – students should get a job right? Give me a break until the end of the month, please? He gives her the flyer with his vacuum and asks if she saw it. She recognizes it and asks if he threw it away? He says, NO, no one would throw this vacuum away! Give it to me, no one would ask for money for you. Then he shows her brothers phone number and says that she asked him to call his number for her. Osol is stunned and says that this is a misunderstanding, I will bring it back right away, but can you give me a discount? Cut to Osol sitting on her brothers back as she yells at him about what he was planning on doing with that money! You should have waited for me first! She gets a call while she is torturing her brother and tells her friend that she cannot go out right now, she is busy. But the scene immediately changes to Osol going out with her friend to her crushes congratulation party for getting a job. She looks very pretty as she walks in with her friend, but is immediately embarrassed when the talk changes to the horse head. However her friends don’t stay on it long and all cheer. Her crush refills her beer for her and rubs her head like a little sister. The friends all ooo and ahhhh about their relationship, smiles are all around. Afterward, Osol sits outside on the steps by herself. Her sunbae comes up and asks her why she is there. She says that she is just getting fresh air. He tells her that he was so surprised that day but heard that she was working or her appa who was injured. Other kids wouldn’t do it. Your a good girl. Lets go inside and drink some more, I was waiting for you when they said you were coming. He gets up and goes back inside. Osol’s heart explodes as she falls back and thinks that he told her she is a good girl. her friend comes out and tells her not to start all this love sickness again, it is disease. But her friend cannot hamper Osol’s joy in this moment that her crush talked to her and confirmed that he was waiting for her. At home, Osol rolls over in bed and texts her crush. OS: Sunbae, thank you for not telling the other kids about what happened. Sunbae: Would you like to come to by job? I will buy you a meal. OS is super excited and starts hoping around in bed. The next day she goes to an underwear store to shop with her friend Joo-yeon. JY – If you give him this present then you will go to the hotel room right away. OS giggles as she looks at the man underpants that Joo-yeon is holding. But she wonders how they can be so expensive. Then all the pictures of models start talking to her about the price to fix the car. Then SG shows up in her imagination and says. $3500! $3500! $3500! With each $3500, Osol gets tinier and tinier. But she hops out of her vision and pays for the briefs. Cut to her meeting with her sunbae at his work. he is a bit late but runs out to her and apologizes. he says that the models are keeping him working (or something like that). She tells him that she can come back later, but he asks her if he can have a favor. Scene change to Sun-gyeol looking at his phone as he thinks about Osol. But then he sees her on TV on a home shopping network eating her heart out. Another quick scene change to Osol’s home where she crashes on her bed. On her phone are messages from her bank and missed messages from Sun-gyeol. it is a pain to see them both. But then she gets a message from Do-jin. DJ: thank you for today, you saved me. DJ: thank you Osol, you are the best. Needless to say, Osol is so happy to receive that text and does a lovely happy dance at home. The next day she calls (or gets a call from) SG who is looking forward to getting his vacuum. But then she gets a call from her sunbae to meet him. Possibly for the meal they missed? She hops up, grabs her gift, and runs off. But when she goes to her sunabe’s company she is pulled away by another woman who tells her that she is ready. She did this before so she can do it again right? Osol tries to tell her that she is meeting someone. But they are all like, yeah, this is that. DJ comes out so Osol tries to tell him what is going on, but he just smiles and says that he will explain it all later. Elsewhere, Sun-gyeol is walking up the hall and talking about vacuum commercials. He sees Osol who is talking to the production manager. This time she will have to model undergarments that tighten your waist. But it is over her clothing. Osol is finally starting to realize that she is being used by her sunbae, DJ. She even overhears him tell the production manager “honey”, and she asks him that he will give her all his money? But it is more questioning. Osol asks Dj if he called her because she had 100k hits on YouTube? Is that why? He tells her that it is a misunderstanding, the kids said you are in a bad position now. That is why I did it, so you will make money. It is better than cleaning, it is good pay and easy. But Osol just calls him an a-hole and tells him that he knew that she liked him for a long time, since the welcome party. But you are confusing me and give me hope so I can’t give up. Now you are embarrassing me. She starts to tear up but tells him, thank you. At least now I am real. My poor three years of liking someone like you. I am glad that it ends here. She walks off to her sunbae calling her name and right into Sun-gyeol. He is about to apologize as well for hearing all of that, but Osol just wipes her tears and walks away without listening. She goes to the back changing room somewhere where she can get a good cry in with no one watching. Later on she comes back out and gives Sun-gyeol his vacuum. She can’t look at him but tells him that she will contact him as soon as she makes some money so she can fix his car. She walks off. His secretary tells him that they don’t have to change his schedule now, lets go. They go to the cleaning commercial which shows all the guys in the home cleaning service vacuuming and cleaning the commercial area. But Sun-gyeols mind is distracted. He leaves and runs into the sunbae in the elevator. The sunbae is talking to his “honey” on the phone and talking about how loves her. But he calls so many different women. Sun-gyeol is so annoyed and stats sanitizing the entire elevator. The secretary puts on her mask as Sun-gyeol sprays his sanitizer all over the sunbae as the sunbae coughs and coughs. He and his secretary walk out of the elevator to a puff of smoke as if this is an everyday thing. But later, the secretary asks him why he did that? He is usually careful when other people are around. SG asks, was there another person there? I did not realize. He keeps walking off. His secretary smiles, knowingly. Elsewhere, Osol eats, drunks, and spills her guts to her friend Joo-yeon about how her crush had a girlfriend this entire time. She tells her that there is something similar between underpants and one-sided love. they both have a dirty ending, like me. her friend asks if she is having fun, but Osol just whimpers that she hates it. She tells Joo-yeon that she knows why she does not get a job, she does not know how to read people. What can she do well? Joo-yeon tells her that it is not her fault, it is that bad guys fault that strung you along! OS – Do you know that racing horses block their eyes to just go forward when they run. No reason, no goals. At the beginning they are surprised with gun sounds. Later they just run. Just run, that is it. JY – What are you talking about? Are you already drunk with just this? OS – The heart that liked sunbae was like that. At the beginning, I just liked everything. Later, because I liked the heart that liked him. Without thinking, without reason, I just liked him. JY – By the way, why aren’t you returning the robot vacuum? VO – A french writer (Standar?) said the person in love, loves. Not the other person. They love themselves that are in love. In retrospect, my three years of liking Do-jin was like that. i had a fantasy of him and of myself laughing and crying. Why didn’t I know those stupid emotions? After getting away from my one sided love fantasy. I only have one underpants that cost one month’s of meals. Osol goes home dejected, she looks at her appa sleeping and then hops in bed herself. OS – Appa….I didn’t even think about appa wearing the same underpants for 10 years. Ah, bad girl, I am so stupid. But then she hops up! ARGH! UNDERPANTS! MY VACUUM CLEANER BAG! Cut to Sun-gyeol at home getting his vacuum out of the bag. Then he gets out the note attached. Sun-gyeol is all like, what in the world? He tosses it to the side. Then he opens the underwear box and sees Elephant underwear and screams. AHHHHH, WHAT IS THIS! Super fun! 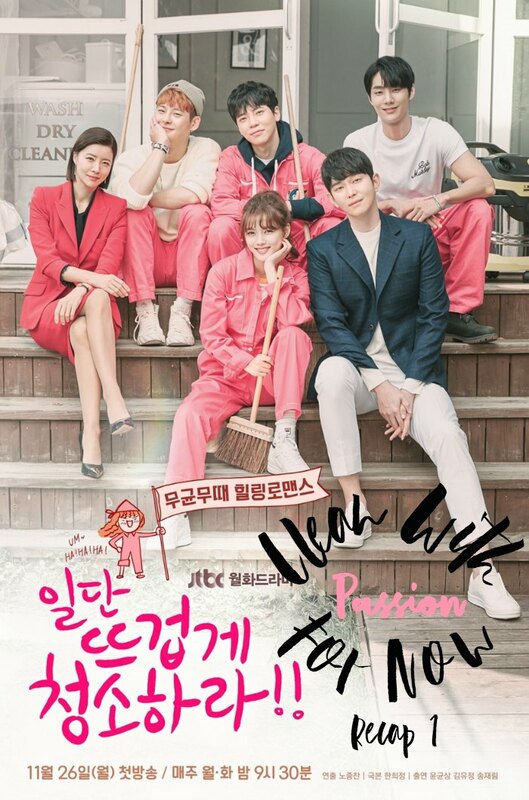 I love the look of this drama and all the acting is hitting my rom-com spots while not venturing into the horrible overacting category. I mean, there is over acting, but it is good over acting. We already recapped episode two, posting soon! Previous Post Memories of Alhambra Watch party!!! You’re welcome! this show is super cute. I’m looking forward to watching more. Thank you V! I started this one today and need something just like this! After Fox Bride and Third Charm, I definitely need something light and fun!